Alexander Dawson of Penn Law (right) and Marek Malik of Wharton fight in the heavyweight bout at Penn Fight Night at the Palestra Saturday. A tall and lean MBA student with a military background came to the Palestra on Saturday night with a sound business plan, given the task ahead. Marek Malik’s fists were taped for the presentation. “You better kick his a--,” a man in a tuxedo and sunglasses said to him. Minutes later, Alexander Dawson IV, a second-year law student from the University of Pennsylvania, raised an objection, a stiff overhand right that sent Malik, a Wharton School student with an eye on a real estate career, wobbling back into the ropes in the first round of their heavyweight match. Thousands of students – young men and women in bow ties, sequin frill dresses, and fur stoles that likely weren’t fake – cheered at the action, raising their tallboy cans of beer and single-serve containers of white zinfandel into the air. At least, those on the Penn Law side of the Palestra did. Penn’s annual Fight Night is a boxing match between two elite American schools, and it’s unlike any match ever hosted in this town. There was no cigar smoke clouding the air as it did in North Philly’s legendary Blue Horizon, and the Penn campus doesn’t have the same industrial vibe as South Philly, where the 2300 Arena still hosts boxing and mixed martial arts. The night’s losers didn’t have to rethink their future plans and the winners were paid only in applause and selfies. If there were side bets, they were done discreetly. “What you might know is that there’s meaning behind our matches,” Anita Oh, one of the event’s organizers, said in a hype video worthy of HBO Sports. Oh was referring to the real winner of Fight Night: the Boys & Girls Clubs of Philadelphia. The nonprofit gets 100 percent of the proceeds. The fights raised about $67,000 last year, and $600,000 over the last 14 years. General admission tickets cost $50 for nine fights, and the thousands of attendees began filing in as early as 6 p.m. for the fights, which started at 7. A VIP area on the Palestra floor around the boxing ring served cheeseburger sliders and macaroni and cheese. The charity is why Malik, a 31-year-old Houston native and former water polo player, agreed to take part. Many competitors, including Dawson, made slick introductory videos with music and exotic-locale drones, and had entourages that shot fake $100 bills into the air. “Can you take a picture of me so my friends know how stupid business school is?” asked Angelo Fu, 30, a Wharton student from San Francisco. Fu wore a mask from the popular Purge horror movie franchise, in which the government allows all crime to be legal for one day. Malik’s intro video was simple, though, featuring a picture of the Boys & Girls Clubs logo and his stoic face. Confetti and fake money litter the floor at the 15th annual Penn Fight Night at the Palestra. Dawson, 25, had redemption on his mind, however, after losing a decision last year. The former Elon University football player was determined to not let it happen again. He carried the same thick frame, the surprising side-to-side movement of a young Mike Tyson, ducking into Malik, who stood 6-foot-4, while trying to bomb him with power from the inside. “Yeah, who doesn’t want to be like Mike Tyson,” Dawson said earlier in the week. While the event is for charity, the fighters want to win and they trained up to six months for these three rounds. Instead of a ramshackle, street corner gym filled with buckets of spit, the fighters trained at the toney Sporting Club at the Bellevue on Broad Street, under the guidance of Gregory Coachman, a former competitive boxer. “The boxing gyms I grew up in didn’t have air conditioners,” said Coachman, a Brooklyn native who now lives in Philly. Coachman refereed several of the fights and more than one was stopped before the third round on his and other referees’ calls. Often, the adrenaline of the night had fighters coming out wild and fast, dumping energy they’d need in the third and final round. 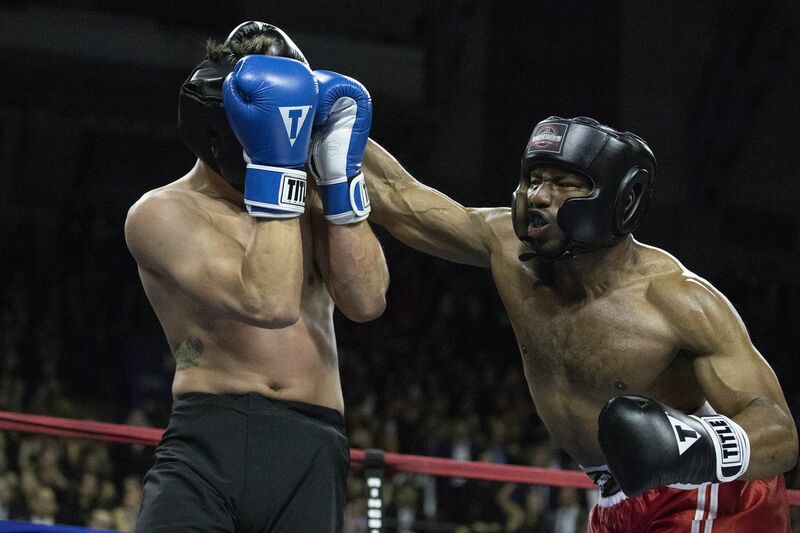 Wharton had already defeated Penn Law, whose team included fighters from other graduate programs such as the School of Social Policy and Practice, when Dawson and Malik entered the ring. Dawson controlled most of the match, but Malik knocked him down hard in the final round and, after getting up and collecting himself, the Haw River, N.C., native went on to get the redemption he’d been waiting for. “He definitely hit me hard,” a beaming Dawson said after the fight. Alexander Dawson of Penn Law makes his entrance before fighting Marek Malik of Wharton in the heavyweight bout and final fight of the night at the Palestra on Saturday. More than 14 family members drove up to watch him. After graduation, Dawson, who went by the alias “Black Lightning” on Saturday night, plans to get into entertainment law. He plans to keep boxing, too, he said, as long as he doesn’t get hit that often with the kind of punches Malik, a Naval Academy graduate, landed. Two of the most decisive wins were Wharton’s women. Laura “Big Swinging” Johnson may have had the best form of all the fighters. Her teammate, Shruti “Shut 'em down” Shah, had a jab like an engine piston. After Dawson’s decision, the crowd filed out onto 32nd Street, where buses were waiting to take them to an after-party at the Tower Theater. A few looked as if they needed to go to bed, but the happiest in the crowd appeared to be the fighters, heroes for the night with bloody noses and perhaps a welt or two. Laura Johnson celebrates after defeating So Jung.